Probably seen this on the side bar now, but this is a larger image of the same. Enjoyed making this; the challenge was to get as many species as I could without it becoming cluttered when shrunk to sidebar size. For the curious, the reason for no yaks was the picture was completed before Party Pooped came out. Why Cheerilee? 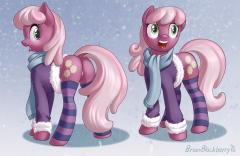 I always imagined her as the tourist type, going on trips (mostly in the summer) to various places in Equestria, collecting images and souvenirs for herself and for future school lessons. 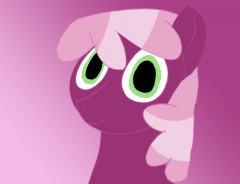 ((OOC Note - OOC Discussion thread is here)) Cheerilee was so excited! One of her favorite perks of being a schoolteacher, adventure and an opportunity to teach and travel all rolled into one, was the field trip! 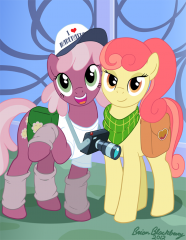 And she loved travel as much as she enjoyed teaching, never going anywhere outside of Ponyville without her trusty camera currently strapped around the magenta mare's neck. This field trip was to show the younger foals of her class all about the profession of farming. Most ponies knew a farmer or two, especially in such a small town as Ponyville, but very few of the younglings knew what happened behind the scenes at a farm unless they grew up on one, like young Applebloom. The original idea had even been to take the foals to Applebloom's home, Sweet Apple Acres, but the large farm was always so busy and didn't have the spare time to give an all-day tour - and besides, sometimes the young foals learned best when they were visiting someplace that wasn't so familiar that they'd stopped seeing it! Fortunately, Applebloom's older sister, Applejack, had an alternative - her cousin's much smaller farm outside of Fillydelphia. So several letters back and forth, the flurry of permission slips, and an uneventful train ride later, here was the small farm AJ had arranged for them to visit: Tiny Apple Valley. The farm lived up to its name - far, far smaller than Sweet Apple Acres, but no less as picturesque and charming, nestled away into its little valley with its colorful apple trees and a few small chicken coops, with the main barn standing over it all. A pony emerged from the barn doors, walking their direction, and she hoped this would be AJ's cousin Apple Bumpkin, proprietor of the farm. 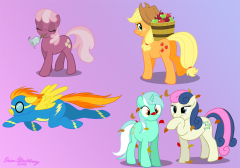 Before the farm pony could reach them, Cheerilee turned to give one last bit of guidance to her class - larger than usual, with several foals from other areas of Equestria coming along on the multi-school trip. "Here we are colts and fillies! Now, be sure to stay on your best behavior, it was very kind of Miss Apple Bumpkin to allow us on her farm, and we need to remember to be respectful and courteous! And pay attention - remember that you all will have to write a paper about what you learned here this weekend for homework." She could hear the groans already, but it was an education trip and she was determined they would come away a little bit wiser. Now, all she could hope was that the class would at least stay… somewhat orderly and not get into too much mischief. Making a set of a dozen different "ponies in socks" magnets for an upcoming convention (these were first showed in pencil in a thread); managed to finish the entire set. Not sure if all are suitable for the gallery (although none are adult), this one though is pretty work safe and cute focused. 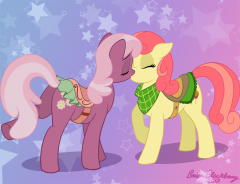 Another pic done for Alison Rose - Its Cheerilee and Apple Bumpkin at the end of some date having their first kiss. Little else to add text wise other than one has to think about how kissing ponies would visually look since there is only one scene of such in the series. Rarity, Pinkie Pie, and Cheerilee have been hinted as long time (or life time) residents of Ponyville. So I imagine they all went to the same schools together. 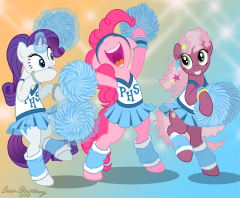 So here they are probably in their last year of school before graduation (well for Rarity and Cheerilee at least) as school cheerleaders (I guess for hoofball). That is my story anyway, really I wanted to do something silly and have an excuse for "Eighties Cheerilee" to be doing something. Of Course Pinkie cheers with the most enthusiasm, and Rarity well she can never get entirely used to Pinkie's style (Cheerilee seems cool with it though). S02EP17 - "Hearts and Hooves Day"